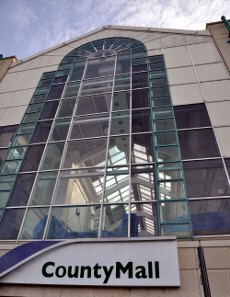 County Mall in Crawley is one of the largest shopping centres in the south-east of England. It hosts about 70 shops and several cafés and restaurants — see our list of shops in County Mall for details. Crawley has pretty much the same chain stores as every other town, and has collected them together in County Mall. Please note that some of the shops in County Mall may open later and close earlier than others. Christmas opening hours will be posted here when they become available. In the past, most shops have been open until 8pm, or until 9pm on Thursdays, in December. Leave the M23 at junction 10, Crawley, and take the second exit onto the A2011, Crawley Avenue. After about a mile you will come to a roundabout with a flyover. Take the second exit onto the A2004, Northgate Avenue. After half a mile, you will come to a smaller roundabout. Take the first exit, and try to get in the outside lane, which may be tricky if there’s a lot of traffic. You will see County Mall ahead of you. At the traffic lights, turn right into the north car park. Alternatively, and if you weren’t able to get in the right-hand lane earlier, go straight on and then turn right onto Station Way towards the south car park. Take the A23 towards Crawley. At the roundabout at Pease Pottage, take the second exit to stay on the A23. After about a mile, you will come to a set of traffic lights. Continue straight on, and get in the outside lane. After a couple of hundred yards you will come to a roundabout containing a large football, with the K2 Leisure Centre visible to your right. Take the third exit (i.e. turn right) onto the A2004, Southgate Avenue. Continue straight on at the first three sets of traffic lights. At the fourth set, with County Mall immediately ahead, turn left onto Station Way. Get in the outside lane immediately and after 100 yards turn right at the next roundabout into the south car park. As an alternative to turning left onto Station Way, go straight on and the next left turn will take you into the north car park. Crawley railway station, on the London to Horsham line, is directly opposite County Mall. Crawley bus station is attached to County Mall. County Mall has two car parks, which can accommodate over 1700 cars in total. The minimum charge (at July 2010) is £2.30 for up to 2 hours’ parking, rising to £20 for 8 to 24 hours’ parking. Parking costs £1.50 for the whole day on Sundays. On late-night opening days, cars arriving after 6pm may park free of charge. The north car park at level one leads directly into Debenhams. The south car park in particular has a awkwardly narrow twisting approach ramp, with plenty of scrape marks. The maximum height of both car parks is 6’ 6”.